Study Question: What is the recommended assessment and management of women with polycystic ovary syndrome (PCOS), based on the best available evidence, clinical expertise, and consumer preference? Summary Answer: International evidence-based guidelines including 166 recommendations and practice points, addressed prioritized questions to promote consistent, evidence-based care and improve the experience and health outcomes of women with PCOS. What is Known Already: Previous guidelines either lacked rigorous evidence-based processes, did not engage consumer and international multidisciplinary perspectives, or were outdated. Diagnosis of PCOS remains controversial and assessment and management are inconsistent. The needs of women with PCOS are not being adequately met and evidence practice gaps persist. Study Design, Size, Duration: International evidence-based guideline development engaged professional societies and consumer organizations with multidisciplinary experts and women with PCOS directly involved at all stages. Appraisal of Guidelines for Research and Evaluation (AGREE) II-compliant processes were followed, with extensive evidence synthesis. The Grading of Recommendations, Assessment, Development, and Evaluation (GRADE) framework was applied across evidence quality, feasibility, acceptability, cost, implementation and ultimately recommendation strength. Participants/Materials, Setting, Methods: Governance included a six continent international advisory and a project board, five guideline development groups (GDGs), and consumer and translation committees. Extensive health professional and consumer engagement informed guideline scope and priorities. Engaged international society-nominated panels included pediatrics, endocrinology, gynecology, primary care, reproductive endocrinology, obstetrics, psychiatry, psychology, dietetics, exercise physiology, public health and other experts, alongside consumers, project management, evidence synthesis, and translation experts. Thirty-seven societies and organizations covering 71 countries engaged in the process. Twenty face-to-face meetings over 15 months addressed 60 prioritized clinical questions involving 40 systematic and 20 narrative reviews. Evidence-based recommendations were developed and approved via consensus voting within the five guideline panels, modified based on international feedback and peer review, with final recommendations approved across all panels. Main Results and the Role of Chance: The evidence in the assessment and management of PCOS is generally of low to moderate quality. The guideline provides 31 evidence based recommendations, 59 clinical consensus recommendations and 76 clinical practice points all related to assessment and management of PCOS. Key changes in this guideline include: (a) considerable refinement of individual diagnostic criteria with a focus on improving accuracy of diagnosis; (b) reducing unnecessary testing; (c) increasing focus on education, lifestyle modification, emotional wellbeing and quality of life; and (d) emphasizing evidence based medical therapy and cheaper and safer fertility management. Limitations, Reasons for Caution: Overall evidence is generally low to moderate quality, requiring significantly greater research in this neglected, yet common condition, especially around refining specific diagnostic features in PCOS. Regional health system variation is acknowledged and a process for guideline and translation resource adaptation is provided. 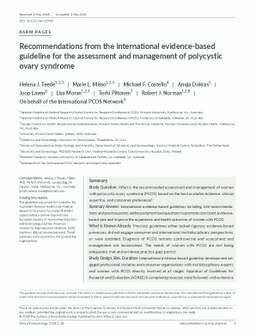 Wider Implications of the Findings: The international guideline for the assessment and management of PCOS provides clinicians with clear advice on best practice based on the best available evidence, expert multidisciplinary input and consumer preferences. Research recommendations have been generated and a comprehensive multifaceted dissemination and translation program supports the guideline with an integrated evaluation program.